Voting for 2016 board member positions happens in November 2015, want to nominate someone? Send your nominees here (anonymous third party). Who will lead the flock in 2016? Are you a licensed Art Therapist in New Mexico? Do you want to take a leadership role or know someone who would be perfect to take a more active role in the Art Therapy community? This is an exciting opportunity to get more involved and guide the advocacy movement in our state. As a local chapter of AATA we have a mission of spreading the power of art as a healing modality. As artists, we know the potential of creating; do your part to share this message! Take a stand. Take the lead. Gathering your troops and respond to the call of action! (3) CEC’s available for $30 or free for students and members. Donations are always appreciated. or shells that once were homes. What history do they hold? There is room for more, from me. Let’s whisper into the rocks. They can keep our secrets, our emotions, our wishes. Shells can be held as they once held life. Stones can lay cool in one’s palm or with a deep warm from the sun. Rocks can be thrown in anger, wind and quake have done worse. Branches may be broken, as they have been before. The natural world calls to us, holds us, and wants to be felt. 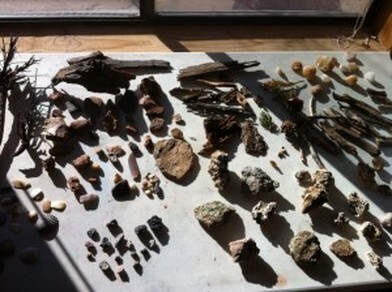 Recently we had the first in a series of Art Workshops at Southwestern College, “Rocktray: Nature as a Medium,” led by SWC grad Karen Wennberg, and current Art Therapy student, Nicole Morgan. They led us through theory related to Sandplay, Art Therapy, and Ecopsychology. They wove experiences of connection between pieces of nature and memory. 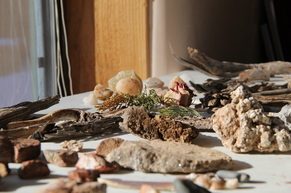 We discussed how to make personal altars, and imbue natural objects with moments, or have them represent archetypal guides, witnesses, or guardians. We discussed how to externalize difficult feelings into these objects, so as to release or minimize discomfort. We experienced how this is personally helpful as well as an accessible offering to our clients. 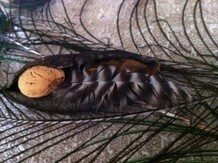 No longer bristling, laying comfortably under. Keeping striking snakes at bay. We hold our seed within. and calm movement through the unknown. 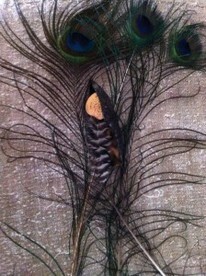 This was made with an avocado skin, an apricot pit, chicken feather, and peacock feathers on a dish rag. See more photos from this workshop, here. To find out about future workshops, or information about leading a workshop, click here.